February 9, 2019 • CATEGORIES: CJ-2A • TAGS: VEC. (11/23/2018) This appears to have a VEC body. The hubs are EasyLoks. Sorry for the ignorance but… What is a Vec and a Vep? Not a dump question at all (I didn’t know what that meant when I started eWillys). Did you mean Vep or VEEP? I don’t know what Vep means, but Veep was a model of jeep built by Hadley Engineering in the late 1960s that placed a jeep body onto a VW chassis. Here’s a brochure: http://www.ewillys.com/2009/12/30/hadley-engineering-veep/ ..
Later, there were other VW Jeep kits such as the Scamp, the Veepster, the e-Veepster, and a couple others. If you have other questions, feel free to email me privately at d@ewillys.com or comment on posts. 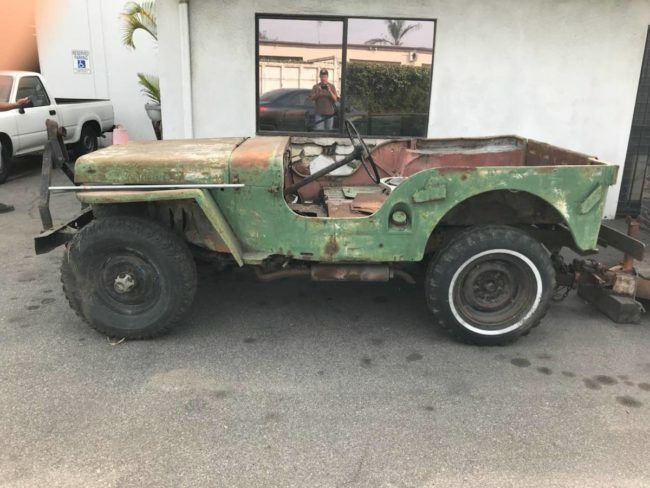 There’s a ton to learn about these old jeeps! Thanks Dave. Really interesting information. I was under the impression the early CJ’s were made from left over MB’s until the MB parts were all used up. It’s not clear to me whether how many MB parts were used vs. MB dies, meaning they had a die they could use to make the panels and didn’t have time at the start of production to make a CJ-2A specific die (someone else might be able to speak to that). Since it takes time to make the body and parts dies necessary, Willys Overland may have elected to use existing dies, proving them more time to create CJ-2A specific dies. A good example of this may have been the driver’s side rear body part. In order to use that part, it had to be restamped with gas inlet hole (and perhaps other minor holes). It was easier to do that initially, which bought them time before the Non-indent driver side panel die was produced. Now, I’m only guessing about this, but it seems like a plausible strategy …. I’m sure someone else knows these tidbits of history. VEP refers to ‘very early production’ WW2 jeeps..for example, the ‘Script’ on rear panel (Ford and Willys), slat grills on Willys, etc…More details can be found online…’VEP MB Willys Jeeps’ and ‘VEP Ford GPW Jeeps’.